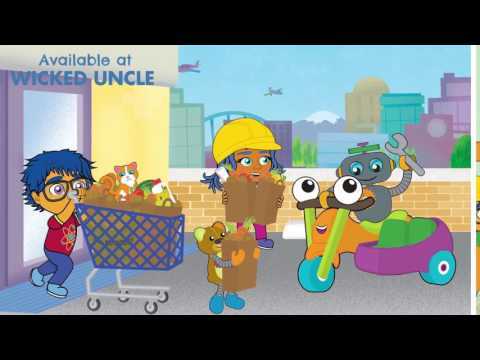 Build ten simple vehicles two inquisitive children encounter in the fun story of their comical trip to the supermarket. Follow the children's journey and build ten different vehicles to help the people in their town solve problems and complete tasks. This 70 piece set has large, colourful plastic building pieces making it easy for small hands to put the models together. Start out by building a minivan to get them to the supermarket, then they'll pass a construction site where they build a crane truck to help the workers lift some beams to the top of their structure. As they continue along their trip, they also build a fire truck, tractor, school bus, motorcycle, cement truck, forklift, pickup truck, and race car to help their friends out. The 32 page illustrated storybook is a really fun and engaging way to learn simple engineering concepts. Complete with a durable storage case, this is an automobile adventure with a difference!